NEW SUNS recruit Jordan Murdoch has revealed he flew to the Gold Coast believing he would be a Saint in 2019 after being delisted by Geelong, but a meeting with Suns coach Stuart Dew changed his mind. Gold Coast confirmed on Wednesday it had signed Murdoch on a three-year deal, securing his services until at least the end of 2021. 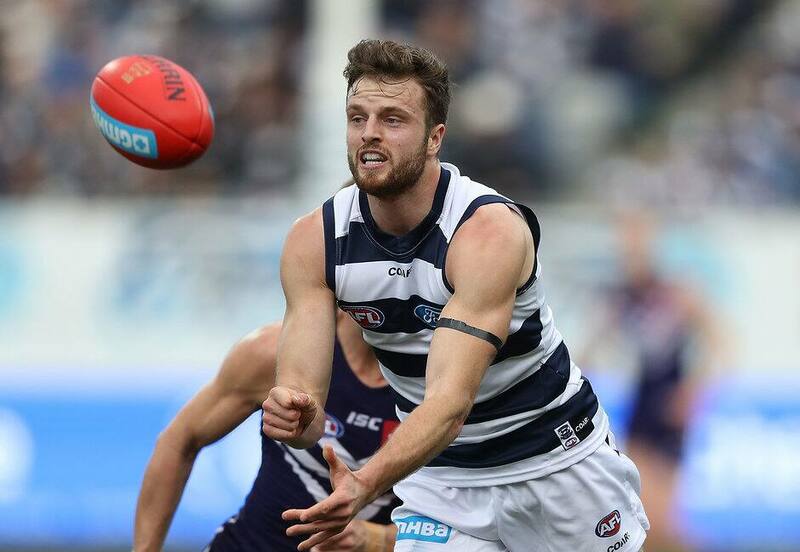 The 26-year-old was blindsided by Geelong's decision to delist him after 108 games across seven years, but he soon found himself being pursued by both Gold Coast and St Kilda. The Suns' pitch was so impressive the experienced midfielder was convinced on the spot to move north, despite initially leaning towards a new home at Moorabbin. "To be honest, when my wife and I flew up to the Gold Coast to meet with them we were very close minded," Murdoch told Macquarie Radio on Thursday. "We probably had just about chosen St Kilda, it just seemed like the logical choice moving from Geelong to Melbourne. I had had a pretty good conversation with Richo (coach Alan Richardson) and James Gallagher. "But having met Stuart Dew, the coaching staff, some of the players and the support staff, and them telling us the direction they wanted to go and the role they see me playing, we couldn't have been more impressed. "We probably changed our decision as soon as we got to the airport that night. It's just a really exciting opportunity." Murdoch becomes the eighth player to join the Suns this off-season, one of whom is his former Geelong teammate George Horlin-Smith. With his speed and acceleration his greatest asset, Murdoch said a move to half-back could be on the cards at Gold Coast, as well as an opportunity to potentially take the kick ins, where changed rules will encourage quick play. The 26-year-old admitted he didn't expect to be moving clubs at this stage of his career, but insisted he harboured no hard feelings towards the Cats. "It was a bit of a shock, but you have to realise that's part of footy," he said. "To be honest I pride myself on my character and how I react to things. "I walked out of the club a little bit confused, but they told me I could use the facilities going forward so I was back in the very next day doing a weight session, giving myself the best chance to be fit if an opportunity did come. "It is part of footy, but it could be a lot worse as far as jobs and leaving jobs [is concerned]."